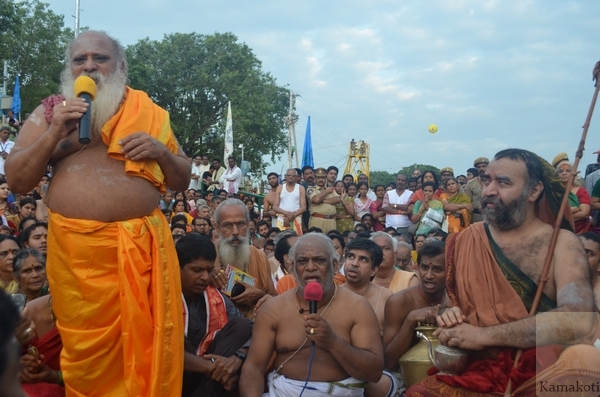 His Holiness Pujya Shri Jayendra Saraswathi Shankaracharya Swamigal left Srimatam camp and reached the Pushkara Ghat in Rajahmundry. His Holiness was received by Principal Commissioner Endowments and other officials. 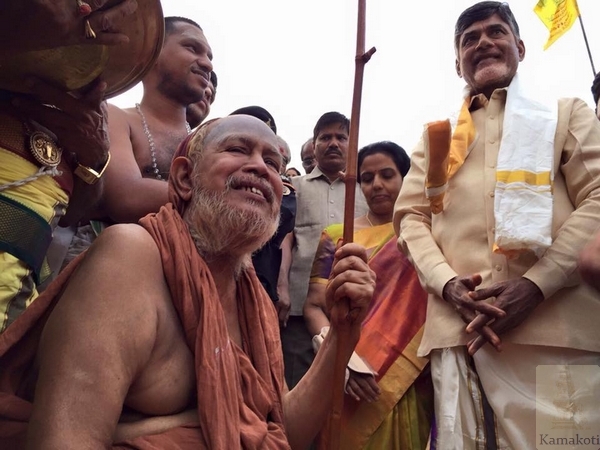 The Chief Minister of Andhra Pradesh Shri Chandrababu Naidu took blessings of His Holiness. Gopuja, Ganapati Puja & Sankalpa was recited after which His Holiness performed Snana. 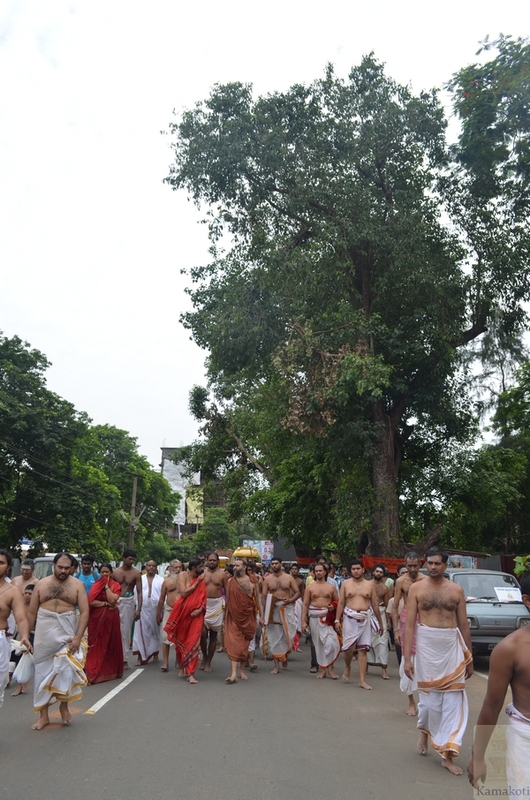 After His Holiness’s Snan all devotees performed Snana. After Arghya Pradana & Danas His Holiness left Rajahmundry and returned to Srimatam Camp. 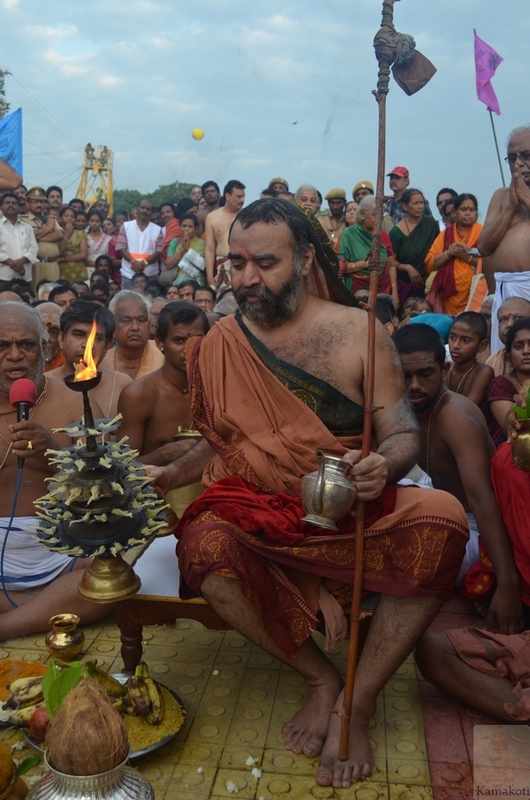 His Holiness Pujya Shri Shankara Vijayendra Saraswathi Shankaracharya Swamigal performed Pushkara Snanam on 14th early morning. His Holiness was received by the collector and other endowment officials and taken to the Goshpada Kshetra Ghat. 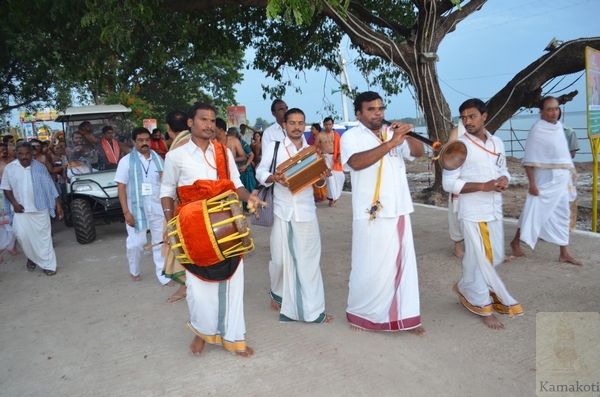 Several devotees who had come to Kovvur and stayed in the Srimatam camp accompanied His Holiness. 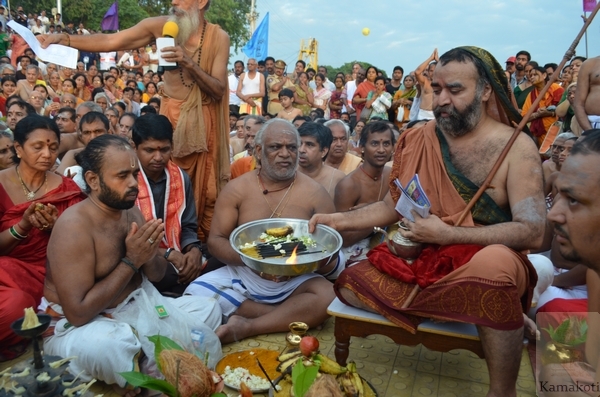 With the blessings and in presence of His Holiness Vinayaka Puja, Kalasha Puja, Godavari Puja, Archana, Naivedya & Deeparadhana was performed in the Ghat. Snana Sankalpa was chanted. 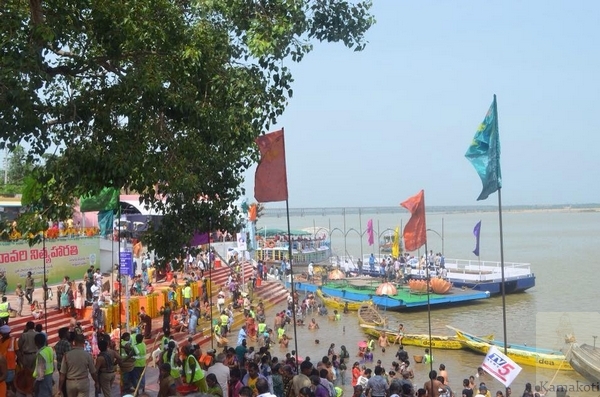 As per the direction of His Holiness everyone took part in repeating few names of Godavari Mata in the Archana namavali and Sankalpa. 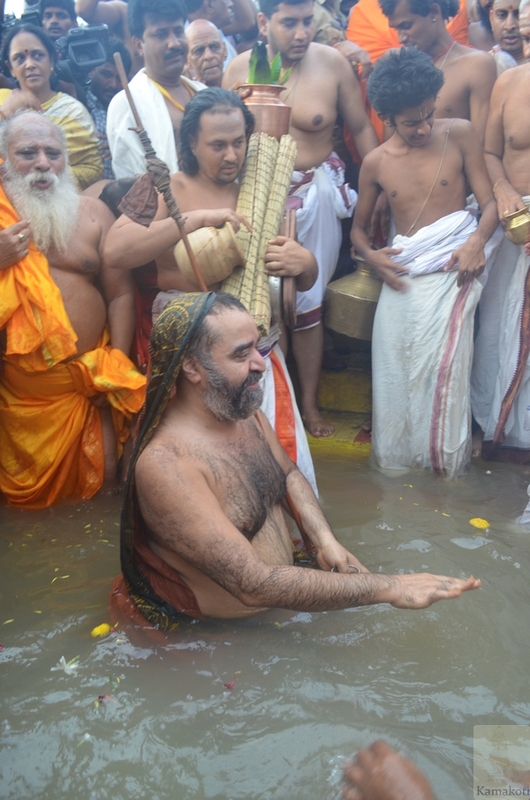 After pouring of Kalasha Teertha in the river and amidst chanting of “Godavari Mata Ki …Jai”, right at around 6.26 AM, His Holiness performed the snana and was followed by people in all the ghats. 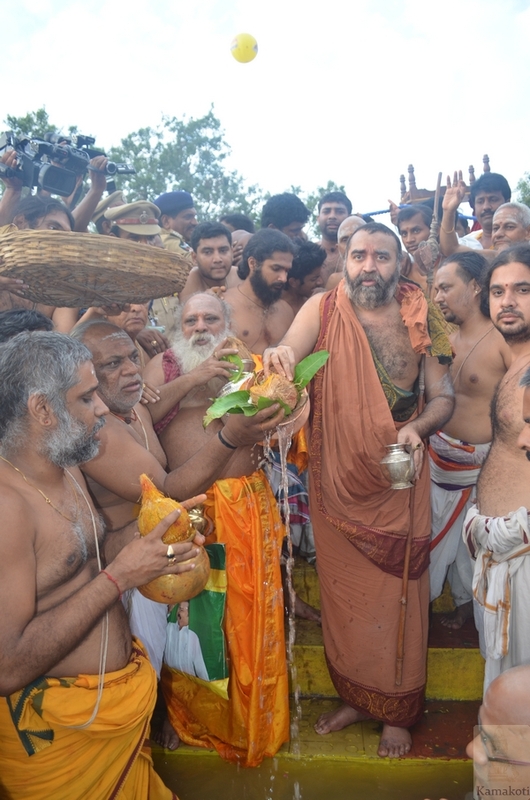 Kovvur Collector, MLA, Chairman and other government functionaries took part in the snana along with other devotees. 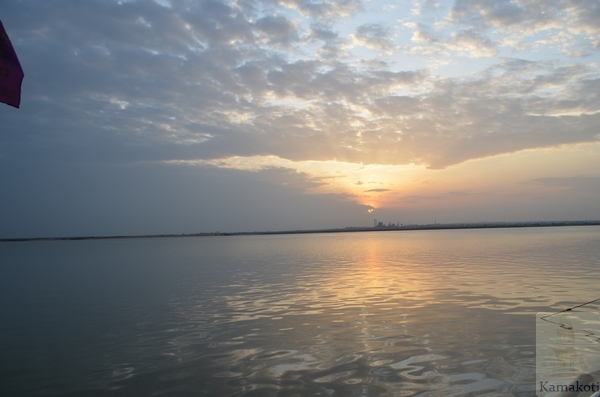 His Holiness then gave Arghya Pradanam. Various danas were performed with the blessings of His Holiness. His Holiness later visited the Shiva temple, Gayatri Temple and Yagnya Shala on the Ghat. The event was covered extensively by media. 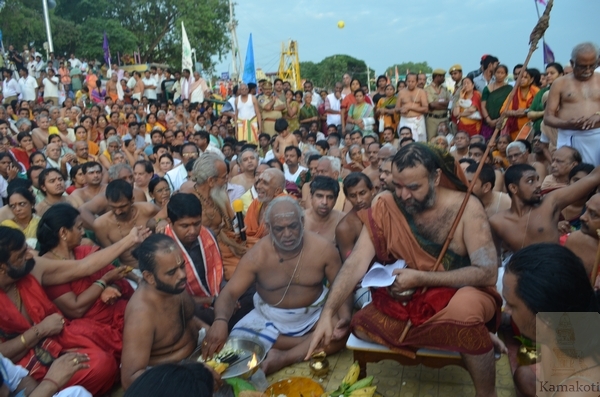 His Holiness said “ Pushkara Snanam Pushkala Punyam”. 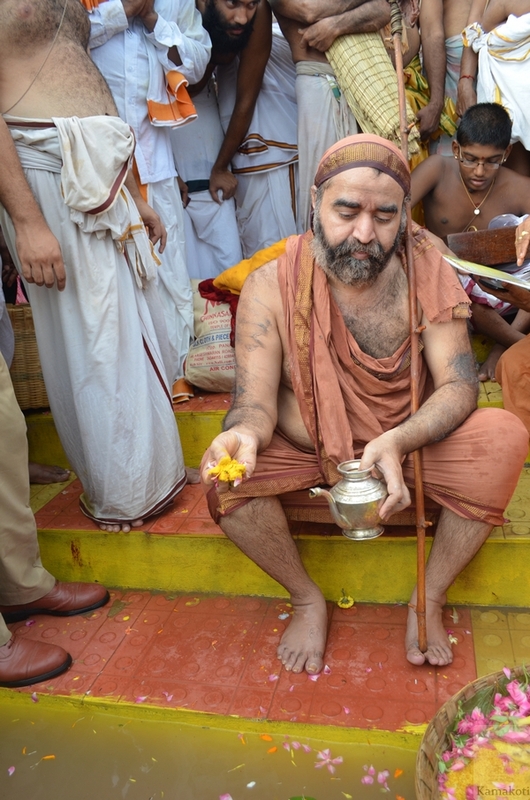 His Holiness later returned to Srimatam camp in Kovvur Sanskrit College.His Holiness Pujya Shri Shankara Vijayendra Saraswathi Shankaracharya Swamigal arrived at Machilipatnam Shankara Matham on 3rd July 2015 in the morning. 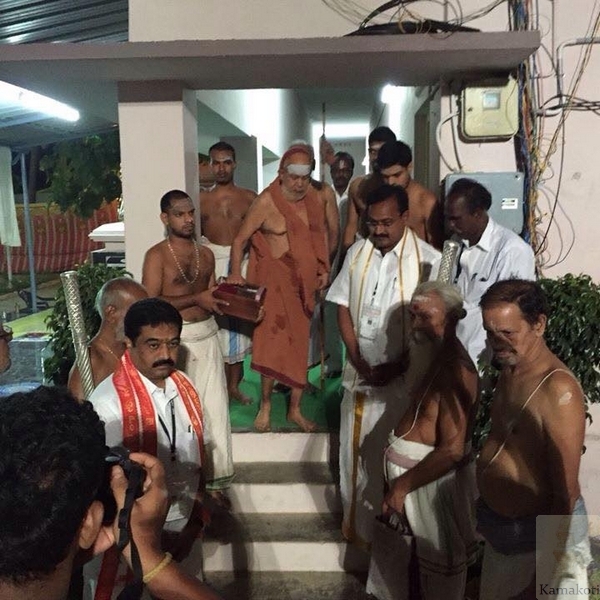 After the nitya Chandramouleeswara Puja, His Holiness gave Anugraha Bhashanam in the evening.